There are many young “Christian” women bloggers these days who have huge followings. They write books and speak at conferences even though they are married and have children. Is this what God has called them to do? No, God has called them first and foremost to be a help meet to their husbands and then a mother to their children and finally, a keeper at home. It’s heady stuff having a lot of people reading what you’re writing. Yes, I have a taste of it but I have to be so careful to not allow it to consume me, even though my children are all grown up and it’s only my husband and me at home now. I still need to make sure I am a help meet to my husband and a keeper at home along with being a grandmother who is available to my grandchildren and daughter to my aging parents. I am thankful that I didn’t have this cyberspace ministry opportunity when I had children in the home because it is very time consuming. My husband often reads what I write, comments, takes any emails or comments from men, and has even written some posts. He, at any time, can tell me to take down a post or change comments and I will but he gives me the freedom to write what I write and study. He knows that I am instructed to teach young women biblical womanhood according to Titus 2:3-5 and is thankful for the ministry the Lord has blessed me with. Every morning during our devotions, he prays over me and my ministry. God has given this ministry to the “aged women” for a reason. Everything the Lord does is for a good reason. Denise Sproul in her book Tending Your Garden had some very good words for women who are finding ministries apart from their husbands. It sort of helps to see the foolishness of wives seeking their own glory and identity when you imagine the church, as the bride of Christ, trying to do the same thing. How absurd! What identity would the church have on its own without the Bridegroom? Silly, isn’t it, when woman is already joined to a man and blessed because of it that she would seek to loose herself and try to do her own thing and be admired for it. Our “glory” as women, like the church, is wrapped up not in making a name for ourselves, but making a name for our husbands under Christ. Our identity should be in him and Him…am I acting in such a way them my husband can trust me? Am I doing him good and not harm all the days of his life? Is my husband known in the gates and does he sit among the elders of the land? 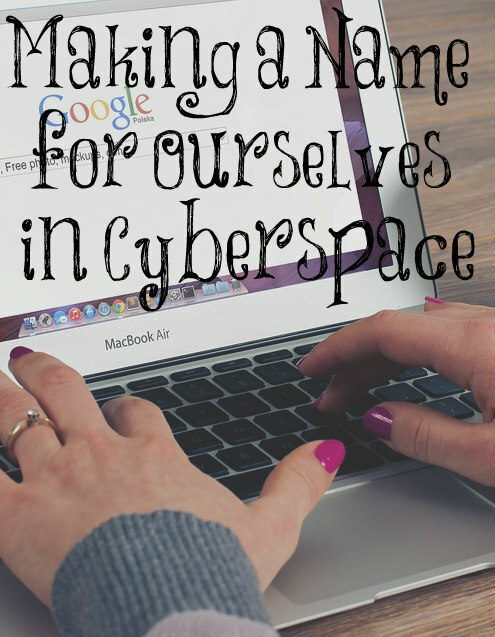 Consider the temptation for women to seek their own identities and followings on the Internet. It seems that many women attempt to make a platform for themselves and their own teaching which is quite separate from assisting their husbands in their callings. Aside from the myriad problems of setting oneself up as a teacher of others, under no ecclesiastical authority to do so (which is certainly not something only grabbed by women), it boggles the mind to think of the time these women devote to their blogs, websites, and commenting on other sites. It is necessary for women to fight the temptation to want to make a name for themselves, even if it is only in cyberspace. And women should be very careful not to justify the time and energy they spend in such pursuits by saying that they are just helping their husband and doing so under his authority. Those women who truly are doing that are out there, but they are few and far between. Mothers, your work in the home with your husband and children is invaluable. You are doing a great work so don’t be tempted to leave (even emotionally and mentally through cyberspace) this God-ordained work in pursuit of name recognition, fame, and/or money even if you think it is your “calling.” Nothing is more important than the work you do within the home for your family. Thanks,Lori, for this great advice. I remember being asked if I would lead a ladies’ Bible study in our church some time ago. I declined. One lady, however, asked me if I had ideas about what topics to study. When I mentioned Titus 2 , the whole idea of a Bible study was dropped. I found that quite interesting. I do want to thank you, nonetheless, for your constant encouragement and teaching through your blog. Yesterday’s post was a breath of fresh air and exactly what I needed to be reminded of. Thanks. You’re welcome! Sadly, Holly, it seems most churches don’t want to do Bible Studies on Titus 2. They would rather use the big name women Bible teachers instead, when women today are in desperate need to learn the principles in Titus 2:4, 5. So true Lori, not to mention so much personal family information going out all over the internet. I am getting older myself, and I know it’s almost time to have more time to be that Titus 2 older woman. Looking back, I would have never handled it well when I was younger. Our place is first being a helpmeet, mother, and home keeper. It’s a lot of temptation for young women today, that’s for sure, and the results have been devastating for some (divorce) which is not worth it in any way. How do you feel about organizing or homeschool mommy blogs/vlogs? I have gotten a lot of motivation from the cleaning/organizing ones and learning resources that made learning easier (sometimes more fun) for my kids from the homeschool ones. As long as they aren’t taking time away from their husband, children, and home (which is difficult), then it’s okay but like I said, anything like this is time consuming and mentally exhausting. Ideally, it should be the older women who are doing this since they have a lot more time and are told to do this biblically. I do not mean to accuse, or shame, or cause any guilt, but from an objective standpoint I have wondered if some of these Christian women authors/bloggers/speakers who have experienced divorce or family problems in recent years would be going through this if they had directed as much of their time and energy to their husbands and families as they spend on their ministry. So glad, Lori, that you have kept your priorities straight according to biblical principles, but still manage to teach and reach out on a daily basis through your blog. So appreciative of your Titus 2 ministry. It is a daily check-in for me. I can’t say for sure but often these women aren’t being keepers at home (since they travel frequently) and how can they be keepers at home when they are so busy doing other things that they haven’t been called to do. I don’t always do it perfectly but my children have long been raised so this makes is so much easier! Thank you for this as it helps to remind me to guard the time I put into my own blog and not allow it to take time from my family.